The can is excellent and these fit perfectly - saves making others fit. You have a great product, we have had our Butterfly can for over 4 years now and we are more than satisfied with your product. I just wish some of the stores in the area handled our size bags IE bedbath and beyond handles all types of bags except ours, we have to order ours from the WEB. We love our simple human trash container and custom can liners. It's clean neat and stylish! These liners are so well made, I am only having to empty trash every 2-3 days now instead of daily! Will never buy anything but simple human again. Love these liners - the fit is perfect and the quality is nice. 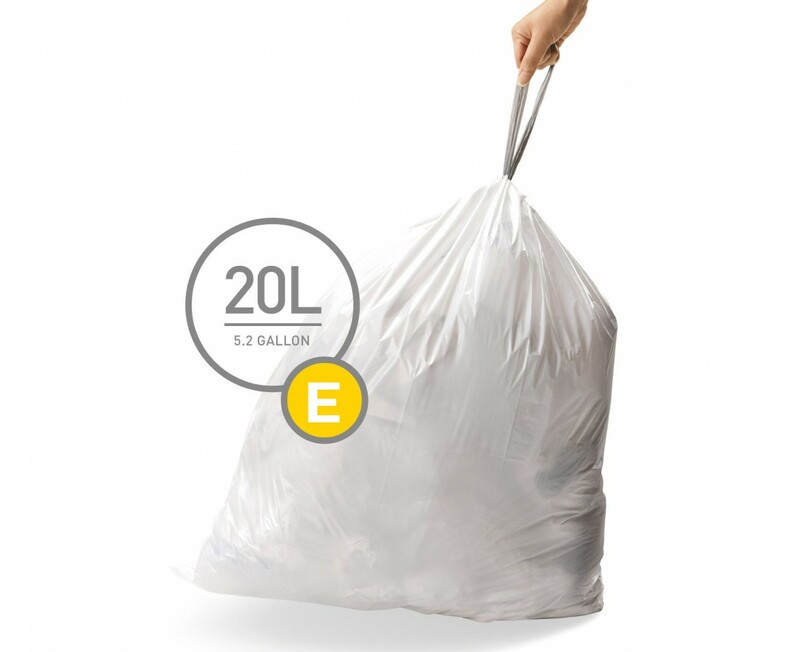 These bags are a perfect fit for our trash can and are very heavy duty. I know these bags will not tear apart and can stand the rough handling from any trash removal person. These bags fit our Simple Human trash container perfectly. Just what we were looking for. Thanks. Easy to fit, easy to close, reasonably priced - very good! One of the liners, unknown to me, had a hole in it, which caused liquid to leak onto the floor after I took out the bag to bring it to the trash can. They don't seem very sturdy. They do fit perfectly in the can though. Unfortunately they're expensive, and I can't find them at my local stores, so I have to order them. I may try more standard bags that aren't a perfect fit but are sturdier. The same great product at 50% off! It's a great deal. good product, OK price, sorry they are no longer available at Bed, Bath & Beyond. The 20 liter size, in our simple butterfly can, works well because it is not too big. A larger size lets garbage get too rank while it fills up. The can fits under counter nicely. I don't see anything similar currently available from SH. Mostly smaller and larger than 20 liter. We have had a Simple Human butterfly trash can for a long time. It is a pain to go to a retailer to buy insert bags. Ordering the right bags in bulk from Simple Human is not only economical, but also very convenient. They fit our can perfectly, very durable and rarely do we have any leaks. Fits perfectly into my butterfly can. No mess and the bags never break. I ordered these trash bags on line. It was an easy web site to use. The bags were delivered promptly. good product, very good service. a happy customer! Your trash can liners are a perfect fit for the can, hold wet and dry items equally well, and don't tear if a sharp-pointed item is included in the trash. These are excellent liners for my little butterfly can, but I was frustrated that I could no longer find this E liner in stores where your products are sold. Fortunately, ordering from your website was almost easier than going back to the store. Service was friendly, quick, and very helpful---and I could buy in bulk! But WHY have you discontined this cute little can??? Ease of installation and collection, fits perfectly. Would like to have a deodorizer as part of the bag. What else can you say about a trash bag ... it works like it should, fits like it should. Good system. The design of your butterfly can and liner is excellent and well made. It serves our needs and pleasing to look at. Easy to use bin with foot pedal and bin liners that are made to fit. Virtually no mess outside of the bin unless one is clumsy. Smart piece of kitchen furniture which is practical and good to look at. Now on our second parcel of bin liners which are excellent to use. I had been looking for an in-between bag size for an unusual-shaped under the sink trashcan and was overjoyed to find these. The standard-size trash can liners were either way too big or too small. These are "just right". Have used for years! Great product(s)! It fits perfectly. It's a fast swop from a used bag to a new one. Personally I like the small size so garbage doesn't sit for days, much like larger bags. Well done Simple Human. Great fit, strong draw-strings, no mess. It's a great looking trash can and it's very practical. These bags fit perfectly, are super strong, and the drawstring handles make it the only choice for me. I love my simple human trash cans and the conveinance of the liners. They are everything I look for in a product. Excellent trash can; it contains odors and the trash liners fit perfectly. I use these bags with my 20 liter Simplehuman butterfly trash can. They are a perfect fit. Unfortunately, my local Bed, Bath and Beyond no longer carries the 20 liter size and I have to order it online. I tried to substitute a trash bag from the supermarket but the bags were either too big or too small. Previously, I had only purchased liners for our kitchen waste can without giving thought to the other wastebaskets throughout the house. With the help of the descriptions and pictures on the Simplehuman web site, I was able to select a liner that fit perfectly in our other similarly-sized and shaped wastebaskets. Since the liners fit so well and are so durable, I don't have to change them every time they're emptied. That saves me time and money in the long run!